Hooah! I made a souffle and now feel like a hero. This is my first attempt to cook it and I'm really glad that everything is OK (and the products didn't go to the rubbish basket!). I decided to begin with the chocolate one because I'm crazy about chocolate and everything connected with it. Must admit that this souffle is one of the best chocolate goodness. The dessert is soft and airy inside, but with crispy crust sprinkled with cocoa powder. It is so magic to break the velvet crust with a spoon and spoon up the smoothy filling. 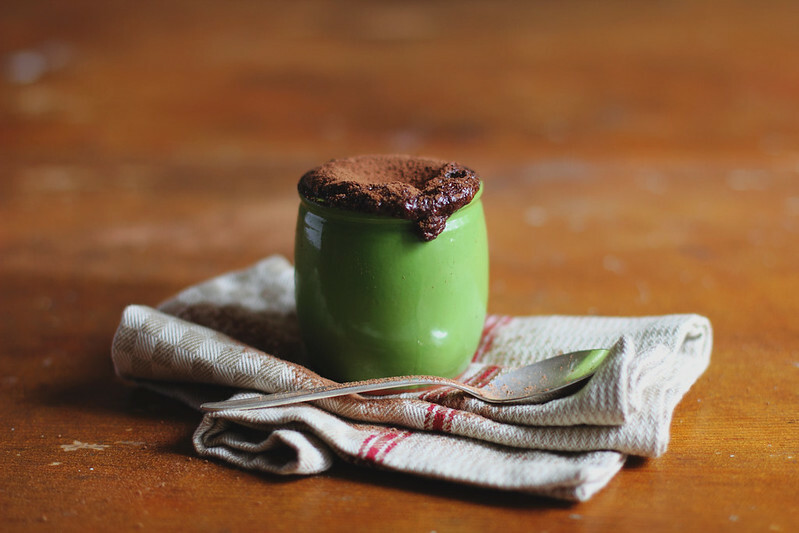 The souffle melts in your mouth immediately leaving the rich dark chocolate flavor. You need only plain ingredients to get a perfect result. But remember: the products must be fresh and good-quality. It is prettier to cook the souffle into small pots - the flavor seems to be better but you can use one big baking dish - I promise it will be the main hero of the dining table. And one more thing: so charming to watch how the souffle becomes higher and higher in the oven. Process: 20 min. Yield 4. 1. Preheat the oven to 200 C. Grease the pots and sprinkle with sugar. 2. Melt the chocolate using water bath. Remove the chocolate from the heat and add butter. Mix well. Add egg yolks, mix using wooden spatula until smoothy. 3. Beat the egg whites with sugar until soft peaks. Add the egg whites to the chocolate mixture, mix well. 4. Fill the pots with the souffle mixture, bake for 15 min. After this time turn off the heat, but let the souffle to cool in the oven. Sprinkle with cocoa powder and attack! Thank you! It is much easier to cook as it may seem. Happy baking to you! What size pots did you use? The picture looks like maybe a cup size. The size is 170 ml. Hello Anna! I just found your blog via your Flickr photostream. Your photography is lovely – I could eat this souffle right off the screen. Hope you get a chance to visit my blog too!